Kangaroo paws come in a rainbow of colors and in full and dwarf varieties. 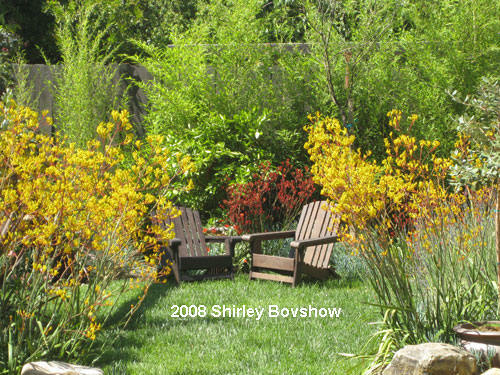 The yellow "Kangaroo paw" plants provide an airy and translucent hedge that separates my private "master bedroom retreat garden" from the rest of the backyard. My intention was to create a "portal" effect into the small grassy area without enclosing it with a dense and solid plant. When the kangaroo paws are in bloom in my zone 10 (Sunset 18 planting zone) garden, from March until early December, the area is a virtual flight zone for hummingbirds! 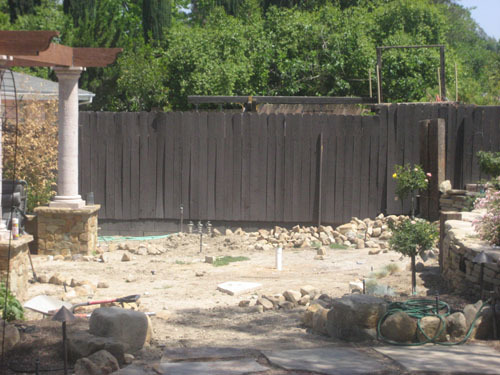 Before photo of my "master bedroom retreat garden." This area of my garden was the last and most difficult for me to design. There were some issues to overcome. My husband insisted on lawn and I resisted it. The fence needed to be softened and I wanted something billowing that moves with the wind, like bamboo, my husband favored vines. I envisioned a private, romantic garden area that was separated from the rest of the backyard but my husband didn't like the idea of closing off an area of the yard. The compromise was solved with a clumping bamboo hedge in front of the fence and the Kangaroo paws that define the private garden without alienating it from the rest of the yard. My husband got his lawn, all 250 square feet of it- I can live with that small amount. My dog thanked me too. A long shot of the garden retreat. In retrospect, I'm glad I planted the lawn because it provides a nice, soft floor to walk on. 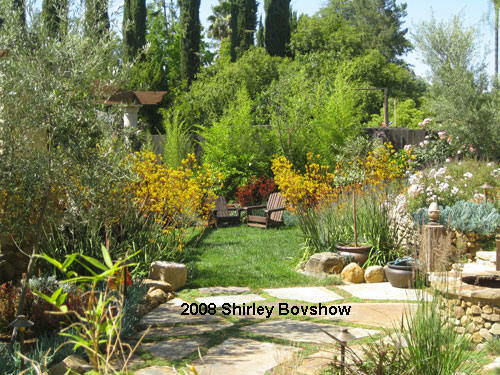 The lawn also offers the eye some rest from the riot of color and texture from the Mediterranean, Australian and native plants that bloom in a continuous cycle year-round. I tucked in edible plants throughout the garden beds including potted citrus trees, potted strawberry guavas and an assortment of fragrant herbs too. My husband and I sit in our Adirondack chairs, talk and eat. The way to my husbands heart is through the fruit in our private Eden. The kangaroo paws are the stars of this garden and give so much, while asking for so little care and water in return. This is my kind of plant! Read my post on caring for your Kangaroo paws for more information. Your garden is simply gorgeous. Thanks for the photos! Are you kidding Susan, you are coming for a “home-grown” dinner, baby! Considered yourself invited! Lovely! I hope to sit in one of those chairs someday…next time I’m in your area, for sure! Hi Nancy and Ferne. Coffee is a great idea- haven’t done that yet. We have enjoyed picking Oro Blanco grapefruits and clementines an arms-legnth away from the chairs, though. It is so much fun and I can’t believe how sweet and juicy they have been this year. Your bedroom garden retreat is a delight — what a wonderful spot to wake up with a cup of coffee! I love kangaroo paws though I first saw them last year they are fast becoming a favorite with me. I love your use of them as a little privacy screen!